Get your Kids and You Back on Track with Fool Proof Tips for A Sleep Schedule Routine That Will Make Your Mornings Easier! Gradually introduce the earlier bedtime routine. My kids have no schedule in summer, so yes we are starting these 2-3 weeks before school starts. Work on getting your kids into a bedtime routine an hour before they would have on their non-summer schedule. This means if they went to bed at 10 for example, ask them to be in bed by 9. This will work on the Little’s but with older children, it will need to be enforced. Of course, the more rested they are the better they will do in school. Remove all technology! This is a hard one because as the parent we have to set an example. Ask your kids to place their cell phones, tablets and games in a required space so they do not feel tempted. If they use their phones as an alarm, invest in a real alarm clock. You can get a basic one on Amazon, Wal-Mart or Target. If a television is in their room you may want to set the sleep timer so you know it will cut off and they are not up all night watching television. 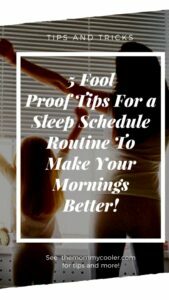 Bedtime Routines do matter! No matter what you need to do get your kids rested for the next day, trust me it will help your routine for the next morning. Having your kids join you for getting their items ready for the next day such as lunches, clothing, and backpacks and such will give them a sense of responsibility to what they need for the next day. It to will also give you help. Bedtime routine is one way to help kids relax more and sleep better. Set rules for screen times when school starts! Good bye tables, listening to those annoying You Tube videos and video games at least until the weekend. What a great way to detox your kids from this. I mean I am guilty of offering my children these items, what parent hasn’t. But this is the time they need to come back and refocus. My rule in my house for the kids is no electronic devices during the school week is allowed unless you are using it for school. If they do need screen time make it minimal, but close it out 1 hour before the bedtime routine begins. Make your bedrooms a safe and exciting environment! Make the bedrooms a place you feel relaxed. Changing a few items in your bedroom can make the difference for you as the adult but it works the same for kids as well. Have them pick out new sheets or comforter set. Set the mood that the bedroom is their and your safe haven and you must feel comfortable in it. If you’re like me there is never enough time in the day even for one change. Making changes is never easy, but they are necessary for making the difference in routines. Believe it or not being in a routine is best for everyone because you feel in control of your day-to-day life. If you want your mornings to go right do this it will make the difference for you and your kids! Did I miss an important tip? 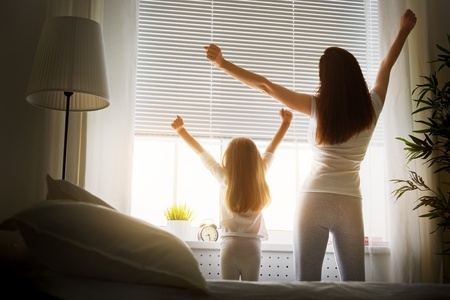 Leave a comment to tell me how you can make your families sleep routine better for better mornings! A Mother’s Weapon: The Kooty Key-The Germ-Free Tool!